A friend who spends time in France each year was baffled about the popularity of Subway with the Gallic people. A lover of French breads and cheeses, she began asking “Why?” The answers were consistent. French restaurants and delis are too prescribed. A croque monsieur invariably includes the same boiled ham, cheese and bread no matter where you order it. The French like Subway because it represents that most American concept — made to order. This came to mind recently after Dumpling Darling opened its third store, in the East Village. DD opened with big crowds. After all, who doesn’t love dumplings? The place was so busy that they had to shut down completely on at least three different days — to catch production up with demand. Few things in a kitchen are more labor intensive than handmade dumplings. I was told Dumpling Darling works 24/7, but their 13-hour-a-day schedule was too much to keep up. They currently list Tuesday as a day off, so there should not be any more surprise closings. 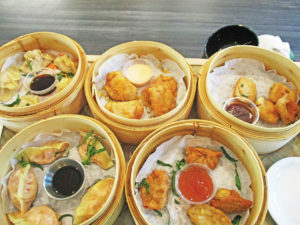 The menu is simple — five steamed, five fried, five bao and four plates, plus fried rice dishes and sides. The place also serves the excellent Tractor organic soft drinks and a full bar. All dumplings were served in lovely bamboo steamer baskets. I have never seen fried dumplings served that way, and it doesn’t seem to work. We watched our order sit, with dozens of other steamer baskets, between the kitchen and serving area for a full 5 minutes before it found its way to us. Unlike every other dumpling house I can think of, there were no condiments on the tables — no soy sauce, fish sauce, chili oil, mustard or hoisin. Those could not even be produced on request. Instead each basket was served with a precise sauce, in plastic ramekins, deemed appropriate by the chef. That is when I thought about the French turning to Subway. Pork and cabbage came with a ginger soy, tofu and kim chi came with vinegar, Russian pelmeni (ground beef and pork with onions) came with malt vinegar and sour cream, sweet and hot lamb came with peanut sauce, and soup dumplings were out of production. On the fried side, potato pierogies, the best dumpling I tried, were served with sour cream, avocado Rangoon with sweet and sour, chipotle tofu with spicy adobo (the best of the sauces), mac and cheese with Sriracha, and Korean chicken with gochujang. A great deal of sauce was wasted, not part of the Earth-loving creed of the place. I only tried two bao, but they tended to be better than the dumplings. I was told the bao buns were scratch-made; the dumpling wrappers were not. Bibimbap was the hottest dish served, temperature wise. Bottom line, DD is a long way from being comparable to the better dumpling houses of America. Things were much better organized at Lola’s Fine Kitchen. This place is owned by a pair of doctors, one Pakistani and one Filipino. They serve the foods of their homeland in a wildly democratic manner that allows a diner to make choices they cannot make anywhere else with various Pakistani and Filipino options. Pick a starch from two noodles, including pancit, two rice plates, including biryani, a cauliflower quinoa or roti bread. Add a protein from 10 choices, including lamb meatballs, longanisa, dhal and tandoori chicken. Add one of six vegetables including some fabulous quick pickles, pico with green chutney, and sigi slaw. Choose from 12 sauces and four brands of Lola’s superb hot sauce. Sunday, 11 a.m. – 2 p.m.
11 a.m. – midnight, Friday – Saturday, 11 a.m. – 2 a.m.